Polbase - Reference: Sulfolobus solfataricus DNA polymerase Dpo4 is partially inhibited by &quot;wobble&quot; pairing between O6-methylguanine and cytosine, but accurate bypass is preferred. Sulfolobus solfataricus DNA polymerase Dpo4 is partially inhibited by "wobble" pairing between O6-methylguanine and cytosine, but accurate bypass is preferred. 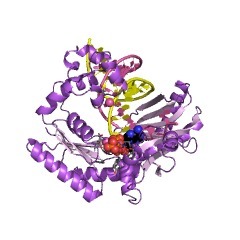 We examined the effect of a single O6-methylguanine (O6-MeG) template residue on catalysis by a model Y family polymerase, Dpo4 from Sulfolobus solfataricus. Mass spectral analysis of Dpo4-catalyzed extension products revealed that the enzyme accurately bypasses O6-MeG, with C being the major product (approximately 70%) and T or A being the minor species (approximately 20% or approximately 10%, respectively), consistent with steady-state kinetic parameters. Transient-state kinetic experiments revealed that kpol, the maximum forward rate constant describing polymerization, for dCTP incorporation opposite O6-MeG was approximately 6-fold slower than observed for unmodified G, and no measurable product was observed for dTTP incorporation in the pre-steady state. The lack of any structural information regarding how O6-MeG paired in a polymerase active site led us to perform x-ray crystallographic studies, which show that "wobble" pairing occurs between C and O6-MeG. A structure containing T opposite O6-MeG was solved, but much of the ribose and pyrimidine base density was disordered, in accordance with a much higher Km,dTTP that drives the difference in efficiency between C and T incorporation. The more stabilized C:O6-MeG pairing reinforces the importance of hydrogen bonding with respect to nucleotide selection within a geometrically tolerant polymerase active site.